Fed up with regular evening snacks? Looking for something that rejuvenates your taste buds? 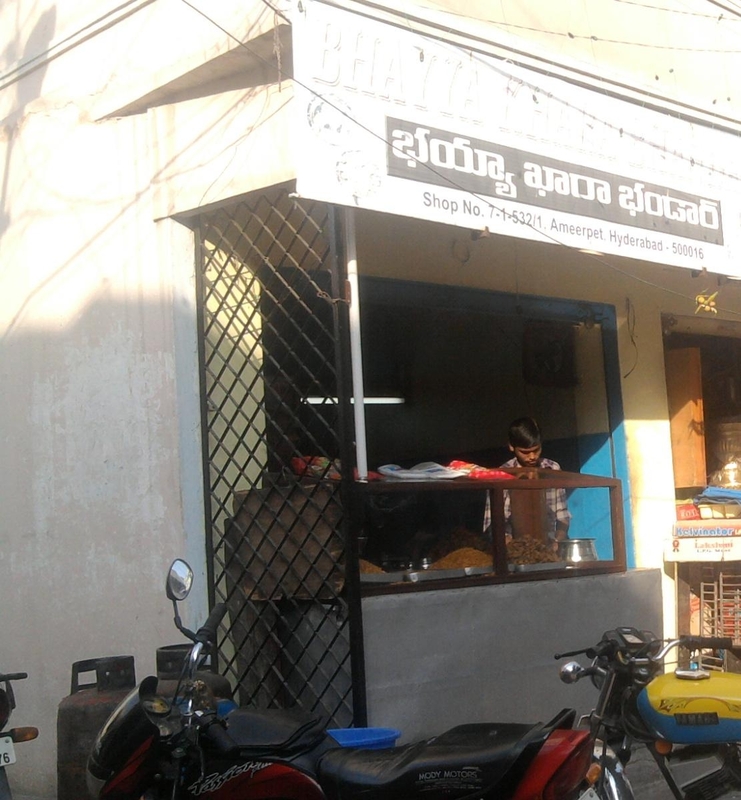 Then visit Bhayya Khara Bhandar popularly known as Bhayyaji at Ameerpet. It is located near Kali Maa temple while going towards Satyam theatre on Balkampet road. It is exactly opposite to MRO office, which can serve you as a landmark. Though the size of the eatery is very small, it is far better than many big ones in Hyderabad in terms of quality and hygiene. Mirchies and Aloo Bondas with chutney and ginger Chudwa are famous here. Along with these, you can also get Palli Pakoda, Onion Pakoda, and Khara. You can also have crispy Cut Mirchi, which is not easily available. Only few pieces are prepared at a time to serve you hot snacks almost at any given time. Quality of maintenance is very good and is one of the reasons for its popularity. As it is a small one, we cannot expect seating and parking facility. It is located in a very small street, people stand and eat here, and many people prefer to take parcel to home. We also recommend you to take parcel as outside pollution is heavy and we don’t want you to take chances. The courtesy of the owner is also worth mentioning as he has the same friendly gesture towards customers who buy items worth Rs.500 or even Rs.5. He is very much concerned about the consequences of the plastic, so he packs all the parcels in paper covers only. He is also very particular about the timings as it opens exactly at 3:30 pm and closes at 9:30 pm. Sunday is closed. This entry was posted on Jan 2010 at 7:39 PM	and is filed under Restaurants. You can follow any responses to this entry through the RSS 2.0 feed. Your Feedback Matters!